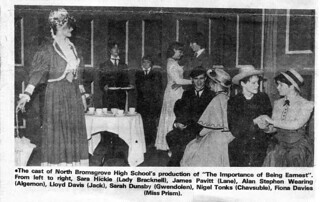 This from the Bromsgrove Messenger in December 1982, I guess. 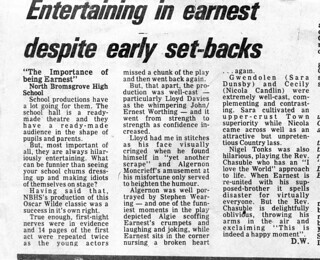 I do mostly remember this production for the thing the reviewer picked up where we repeated 14 pages of the first act because we got lost. I’m pretty sure I was hamming it up appallingly, and I probably was doing a lot of “face acting” but it seems to have gone down well. Nonetheless, I have a lot of sympathy with those who are picking away at their old wounds. If you’d asked me in November 1990 (while I was honeymooning in Malta and desperately trying to find out what was really going on back in London)what reaction I’d have if she actually died, I’d have probably given you a list of reasons why I would enjoy dancing on her grave. I joined the Labour Party at the age of 18, toward the end of 1983, partly in response to the horrendous election result in June of that year. I think I was told at home to “stop moaning about it and go and do something about it”. As a recent school-leaver without a job and as a member of the Labour Party Young Socialists, I was active throughout the following year in campaigns to support the printworkers in dispute with Eddie Shah and supporting miners on strike through 1984 and ’85. So all through the eighties I was involved and awake to what was going on. And all through that period, I hated Thatcher and the rest of the Government. But I can’t do that any more, it stopped working for me. This isn’t piety, it’s self-preservation. Next Wednesday, while a coffin-bearing gun carriage trundles down Fleet Street to St Paul’s I’d like to do something other than the obvious choices of cheering or jeering. I think we need to focus rather on the release of resentment and ways to find reconciliation, preferably without talking about MHT or her colleagues at all. So I’ll be holding Human Scale Conversations on those themes. If you’re interested in doing something different on that day, come along. I’ve not settled on a venue yet, but somewhere away from Whitehall and The City – maybe the weather will be kind and we can go somewhere in Hyde Park. I’ve put up a #wewillgather event and see what happens. BTW this explains Human Scale Conversations. UPDATE/AFTERTHOUGHT I’m doing this in Central London, but if you’re not here on Wednesday, I’d strongly encourage you to organise you’re own event in a similar vein.